This Money Insignia Ring was created by the Origami Resource Center and you can find diagrams for the model here. 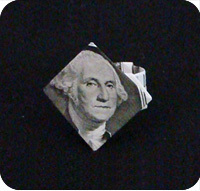 The great part about this model is that George Washington’s face is visible at the front of the ring. 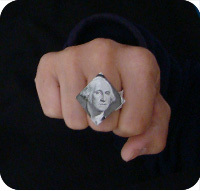 You don’t even have to use a dollar bill. 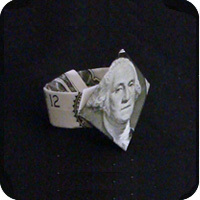 You can use nicely patterned origami paper with this design and it makes a really pretty ring. 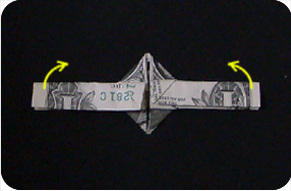 Start with a crisp dollar bill with the green-side facing up. 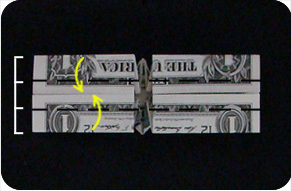 Fold the money in half lengthwise but only crease the left and right edges. Leave the center uncreased. 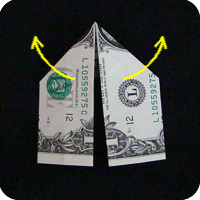 Using the creases made above as a guide, fold down the top and bottom edges so they meet at the center. 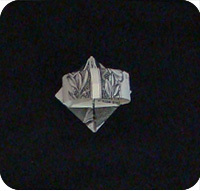 Fold and unfold the model in half crosswise. Fold the left-half and the right-half of the model up so the bottom-edges meet at the middle. 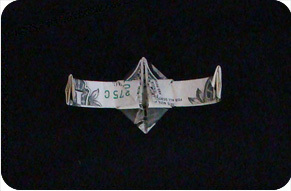 Fold the left-half and right-half of the model downwards so the top-edges meet at the center. Work with the left side of the model and find the crease marks. Repeat on the right side of the model. 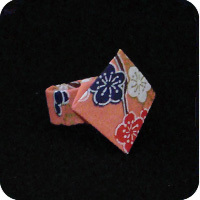 Fold the right-side towards the left positioning the fold so it passes through the existing X-shaped creases. Pinch the model at the location where the creases intersect. The model will buckle up towards you. At the same time, swing the left-side of the model towards the right. Fold the top layer back to the left. Repeat step 9 on the right-side of the model. 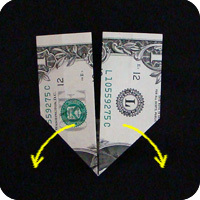 then fold the right side towards the left. Fold the top layer back towards the right. This is how it should look like. 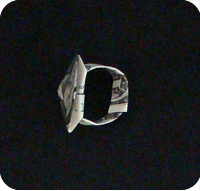 This will be the band part of the money insignia ring. Fold the dollar bill into thirds. The goal is to make the band more narrow. Bring the two ends together. Insert one end into the other to complete the ring.